BREAKING: President Hassan Rouhani has registered his candidacy for re-election. Addressing reporters after filing, Rouhani said he had fulfilled pledges during his first term, with an improved economy and new projects. He cited a $20 billion dollar initiative to be inaugurated in the port city of Assaluyeh in southern Iran next week. ORIGINAL ENTRY: Iran’s Foreign Minister Mohammad Javad Zarif is in Moscow for talks with his Russian and Assad regime counterparts about the Syrian crisis. The conference comes two days after Russian President Vladimir Putin and Foreign Minister Sergei Lavrov had long discussions with US Secretary of State Rex Tillerson. 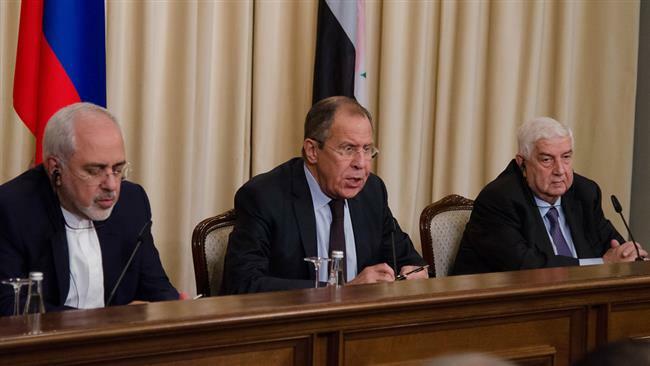 Lavrov then saw Syrian Foreign Minister Walid al-Muallem on Thursday. It is the first meeting among the three Foreign Ministers since October. No details have been given of Friday’s agenda, although it is likely to include a coordination of the line over last week’s Assad regime chemical attack on a town in northwest Syria and the US response, its first deliberate missile strikes on a regime airbase. Lavrov may also discuss the international initiative, represented by Tillerson on Wednesday, for Moscow to distance itself from President Assad. By the end of Thursday, 638 people registered as candidates for the May 19 Presidential election. The highest-profile candidate so far is former President Mahmoud Ahmadinejad, with his surprise registration on Tuesday. His former Vice President Hamid Baghaei also declared, apparently in the hope that one of the two men will be approved by the Guardian Council to staff. Former Oil Minister and MP Mohammad Gharazi and Assembly of Experts member Grand Ayatollah Hashem Bathaei Golpaygani also filed. President Hassan Rouhani and the man expected to be his leading principlist challenger, Ebrahim Raisi, have not yet registered. The deadline is Saturday. Raisi, the head of the leading religious organization Astan Quds Razavi, led the vote among five finalists in the recent vote by the new conservative-hardline bloc, the Popular Front of Islamic Revolution Forces. Spokesman Marzieh Dastjerdi said on Thursday that the Popular Front will permit all five finalists to register and will decide on a single candidate at a later date. In addition to Raisi, the hopefuls are Tehran Mayor Mohammad Ghalibaf, former Education Minister Hamid Reza Haji Babaei, and former MPs Mehrdad Bazrpash and Alireza Zakani. NextTrumpWatch, Day 84: Why was “Mother of All Bombs” Dropped on Afghanistan?